Mushroom, cheese, tomatoes, green pepper and onion, served with Two strips of apple wood bacon, home fries, English muffin and Smothered in our famous sausage gravy...Yummo!! Ham, green peppers, onions, and melted cheddar jack cheese. Smoked sausage, green peppers, and onions topped with cheese and served with salsa, home fries & toast. Mushrooms, green peppers, spinach, onions, and tomatoes topped with cheddar jack cheese. Omelets are served with your choice of grits or potatoes and toast or biscuit. Diced ham, bell peppers, onions and cheese. Sausage, swiss cheese, american cheese, mushrooms, onions and tomato, sprinkled with parmesan cheese. Spinach, mushroom, tomatoes, onions, peppers and cheddar cheese. Sausage, green pepper, mushrooms, tomato and onions topped with melted cheddar cheese. Sausage, cheese, tomato, and onion folded in a flour tortilla topped with salsa and sour cream. Bacon, Sausage, and Ham mixed together with cheddar jack cheese. 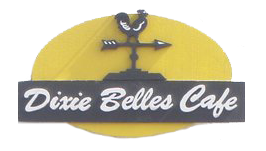 All Combinations are served with 2 eggs and your choice of grits or breakfast potatoes and toast or biscuit. Grilled or Fried, choice of homefries, hashbrowns or grits and biscuit or toast. Two poached eggs with sweet ham over English muffin, topped with hollandaise sauce and your choice of breakfast potato. Delicious fresh cut home fries smothered with our Famous sausage gravy or melted cheese and topped with two eggs (your style) and choice of applewood bacon or sausage patties and toast. Homemade biscuit topped with Dixies's Famous sausage Gravy, 2 strips of applewood smoked bacon & 2 sausage patties served with 2 eggs. Two poached eggs with spinach and applewood smoked bacon, over English muffin, topped with hollandaise sauce and your choice of breakfast potato. Country Fried Steak or smoked sausage on open biscuit layered with your choice of potatoes, 2 eggs (your style) & smothered in Dixie's famous sausage gravy. 2 eggs, 2 buttermilk pancakes served with your choice of 2 applewood smoked bacon strips or 2 sausage patties. Try our signature homemade Sweet Potato Biscuits. 1 pc of Bacon or Sausage, and 1 pc of Toast. 1 pc of Bacon or Sausage.